Archbishop Chaput has,IMHO, a profound article over at First Things: Fire On The Earth: God’s New Creation and the Meaning of Our Lives. The man who wrote those words was Dietrich Bonhoeffer, the great German Lutheran theologian. For Bonhoeffer, Scripture was not an academic discipline, or a personal hobby, or a collection of useful wisdom. It was the living Word of God, the furnace that powered his life. And it had a cost. It led him to oppose National Socialism, then to work against Adolf Hitler, then to his arrest, and finally to his execution. 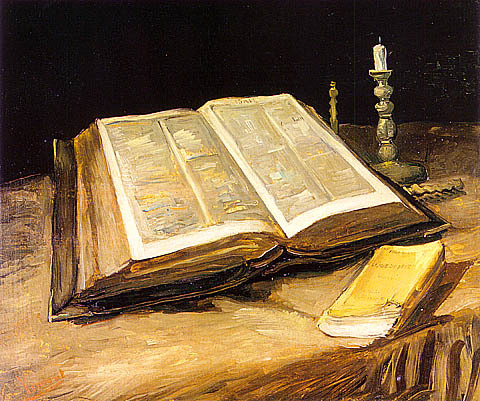 There’s nothing tepid or routine about a real encounter with Sacred Scripture. In his Narnia tales, C.S. Lewis warned that Aslan is a good lion, but he is not a “tame” lion. Likewise, God’s Word is profoundly good, but it is never “tame.” Augustine thought Christian Scripture was vulgar, inelegant, and shallow—until he heard it preached by St. Ambrose; then it grabbed him by the soul, and turned his world and his life inside out. When Jesus said “I came to cast fire on the earth, and would that it were already kindled” (Lk 12:49) he spoke not as an interesting moral counselor, but as the restless, incarnate Word of God, the Scriptures in flesh and blood, on fire with his Father’s mission of salvation. We live in a time that treats science not simply with the respect we should feel for a useful tool, but with a kind of idolatry for the power it seems to promise us. Sin is an “unscientific” idea, an embarrassment to human pride. Therefore it’s out of fashion. But unfashionable does not mean untrue. The proof of original sin is written on every page of the record of the last 100 years: the bloodiest in human history, with the worst sort of barbarism done in the name of the highest sounding political idealism. Sin is real. And more to our point today, the fact of original sin is a foundation stone of the biblical narrative. The cross of Jesus Christ means nothing at all if original sin is unreal. A Gospel of “redemption” makes no sense if we have nothing—no captivity to sin and death—that we need to be redeemed from. Sin makes us, as St. Paul says, “fall short of the glory of God” (Rom 3:23). It defaces who God intended us to be. Sin quite literally “de-humanizes” us. This is its tragedy; but it’s also the context for understanding the mission of Jesus Christ. Get thou over to First Things and read the whole article. This entry was posted in Scripture, Sin and tagged Archbishop Chaput, Catholic Bible, Dietrich Bonhoeffer, Word of God. Bookmark the permalink.